Meet the 12 AXA Solution Match finalists! 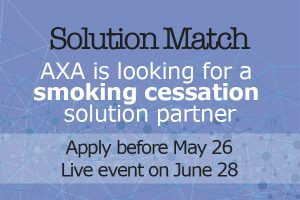 AXA is partnering with eHealth Hub and its Solution Match service to source nutrition and smoking cessation solutions. The call for applications attracted a lot of attention: over 70 companies submitted their solutions from all over Europe – United Kingdom, France, Spain, Finland, The Netherlands, Germany and many more. 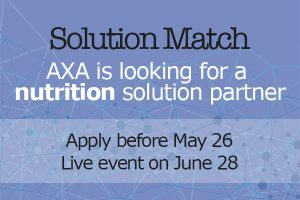 Among them, 12 companies were carefully selected to present their solutions at the Solution Match Live event that will take place on June 28th from 13:00 to 19:00 at AXA headquarters in Paris. “We were very impressed with the number and quality of applications to these 2 calls for solutions. As insurers hold an important key to unlocking large scale implementations in Europe, we are thrilled to partner with AXA, the number one global insurance brand operating in more than 60 countries, on these initiatives. Our Solution Match service is a great example of how eHealth Hub can help close the gap between large corporations and SMEs to advance the digital health industry in Europe.” Pascal Lardier, Principal at [édito]Health. We have secured key decision-makers at AXA to be part of the review panels on June 28th and we are very much looking forward to introducing them to 12 leading European solutions!